Here is a brief introduction to the genetic make up of my rabbits' colour patterns, and there follows links to more information on rabbit colour genetics within my site. 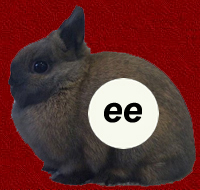 One of the recessive alleles on the E gene series, which controls the extension of colour to the fur tips is known as non-extension, denoted as e. Although they won't necessarily display the physical characteristics of the e gene (as it is masked by the dominant E allele) and pass it on to each of their offspring, all the rabbits I use in my breeding program carry this gene so I'm able to breed orange (agouti pattern non-extension), tortoiseshell (black self non-extension) and sealpoint (shaded self non-extension). 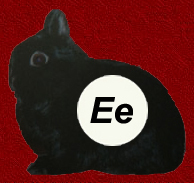 What the dominant normal extension E allele allows the presence of black pigment to appear in the fur tips and in the undercolours of practically all Netherland Dwarf varieties. All the recognised varieties except orange, tortoiseshell and sealpoint are bred with the E allele. Normal extension E does not affect the intermediary band colour of the hair shaft. 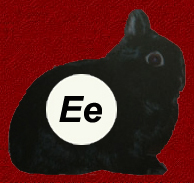 The non-extension e allele restricts the normal extension of black pigment in the undercolour and at the fur tips. It does not affect the underlying yellow pigment. Non-extension e is fully recessive to normal extension E so must be inherited in a pair in order for its gene action to take place. We can see the action of the non-extension genes on a self black dwarf, in which the ee alleles remove most of the black pigment from the undercolour and surface, leaving the body yellow and lightening the undercolour from the black's usual dark grey to a much lighter shade. Below is an example of when a tortoiseshell offspring is produced from a pair of black parents, each of whom is carrying one non-extension e allele recessively.